So this week we've got some special guest stars crashing at our house. In return for our pool we basically have ever meal prepared for us. And on top of it all....every dish gets a photograph (or 2, or 3...). Last night after we put the kids go to bed....here's what Aunt Debi and cousin Daniella served... Raspberry lemonade margarita Ingredients: For the puree - 1.5-2 cups fresh raspberries 1-2 tbs sugar Put the first two ingredients into a small sauce pan and bring to a boil. Let simmer for 3 minutes. Strain in a mesh colander and use a spoon to press all the liquid through. Let cool in the fridge. For the rims of the glasses: 1/4 cup sugar 1 lime Place a 1/4 cup of sugar on a small plate and add zest of 1 lime and mix to combine. Run the cut side of a lime to the outside of our margarita glasses and twirl through the sugar/lim plate. To complete the drink: 4 oz. of lemonade (we made our own by squeezing the juice of 4 lemons and adding water and sugar to taste) 4 tsp of raspberry puree 4 oz. of good quality silver Tequila Fill cocktail shaker about 3/4 full of ice, add 2 tsp of the raspberry puree, 2 oz of lemonade and 2 oz of tequila. Shake and pour....CHEERS! 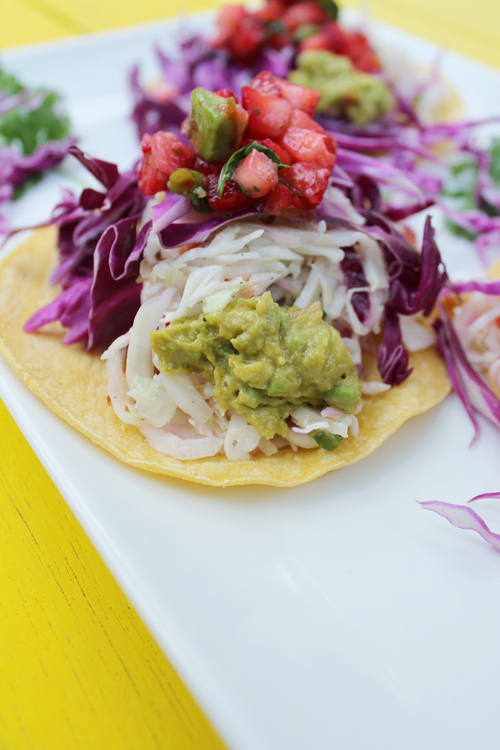 Fresh fish tacos: So here's the story with this recipe...there isn't really one. We totally made it up. Let me try to tell you what Aunt Debi did here.... First I took her to the fish market and we chose the best looking fish to throw on the grill. We chose tilapia. 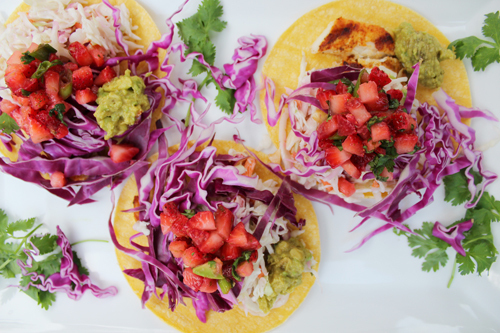 Then we went to the farmer's market and chose the veggies that would be compliment a fish taco: * cilantro * red cabbage * avocados * strawberries What did we do with the strawberries? We're getting there...one sec. Ok so here's how we put all of this together... We started with the fish - hit it with some olive oil and every spice in the cupboard: cayenne, garlic powder, pinch of pepper, Kosher salt and loads of paprika. We fired up the grill and got it really really hot. We brushed the grills with grapeseed oil so the fish wouldn't stick. I threw the fish on and grilled it up for about 3-4 minutes per side. When I took the fish off the grill I put it right into a heat safe bowl and we flaked it up to prepare for the tacos. To top the tacos Aunt Debi whipped up a few things.... 1.) Coleslaw: Pre-shredded bag of slaw from the grocery store hit with coleslaw dressing. Aunt Debi added in some cranberries and cashews. Deb also shredded up some red cabbage to top the tacos and make our dinner look extra pretty. Guacamole: So this is Aunt Debi's version of guacamole...missing a few ingredients but who cares it tasted great. 2 avocados smashed 2 tbsp of salsa 1/2 lime, juiced salt and pepper to taste pinch of cayenne Perfect for topping your tacos. You know what else is the perfect topping? 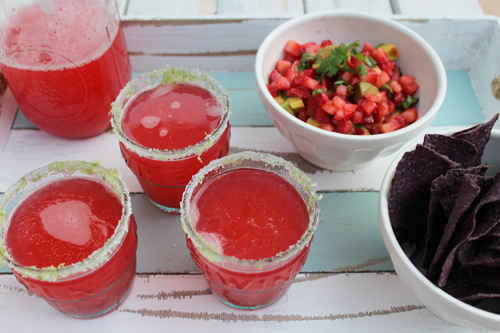 Spicy strawberry salsa. Here's how we made it... Start by chopping up a bunch of strawberries. How many? As many as you'd like! Go nuts. Seed a jalepeno and chop up fine. Add in with chopped cilantro and the juice of one lime. We added some chopped avocado and served this gorgeous salsa alongside some blue corn chips and our raspberry lemonade margaritas. Does dinner get better then this? I don't think so! I hope Aunt Debi never leaves.... For more on what she is cooking in the Hamptons you can see her blog Simply Beautiful Eating.